Graham Greene's classic exploration of love, innocence, and morality in Vietnam. MI6's man in Havana is Wormold, a former vacuum-cleaner salesman turned reluctant secret agent out of economic necessity. Described by Graham Greene as "the only book I have written just for the fun of it," Travels with My Aunt is the story of Hanry Pulling, a retired and complacent bank manager who meets his septuagenarian Aunt Augusta for the first time at what he supposes to be his mother's funeral. "This is a record of hate far more than of love," writes Maurice Bendrix in the opening passages of The End of the Affair, and it is a strange hate indeed that compels him to set down the retrospective account of his adulterous affair with Sarah Miles. For Arthur Rowe, the trip to the charity fête was a joyful step back into adolescence, a chance to forget the nightmare of the Blitz and the aching guilt of having mercifully murdered his sick wife. 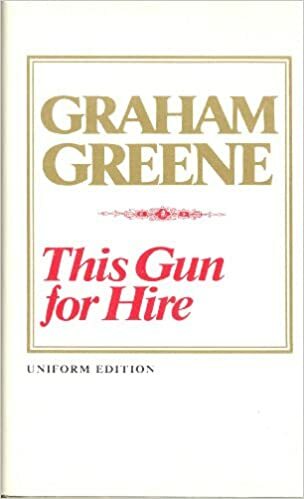 "This Gun for Hire" is an early-career British crime drama/thriller by much honored twentieth century English author/screen writer Graham Greene (The Third Man,The End Of The Affair). The book is set in England, a country then unhappily anticipating the start of World War II. Three men meet on a ship bound for Haiti, a world in the grip of the corrupt "Papa Doc" and the Tontons Macoute, his sinister secret police. The Public Library and Friends of the Public Library present our annual book to film adaptation event! Please join us for our annual celebration of book to film adaptations with free movie screenings at the KiMo Theater, Main Library, Juan Tabo Library, and Special Collections Library. This year all the movies are adaptations of works by Graham Greene! Beginning with The Quiet American and continuing through the month, these classics will keep you on the edge of your seat. Presented through a partnership between the Public Library Albuquerque and Bernalillo County, the KiMo Theater, and Friends of the Public Library. All screenings are free; no tickets required.